Here you can buy some of the world's most highly regarded 100 oz Silver Bullion Bars by highly esteemed silver refiners like Engelhard, Johnson Matthey, Heraeus, and PAMP Suisse. Buying 100 oz Silver Bars produced by reputable silver bullion refiners is often the choice for those silver bullion investors who seek value and quality yet also want to acquire silver bullion at low price points. In general, bulk 100 oz Silver Bars retain their value regardless of age while some brands (e.g. Engelhard & Johnson Matthey) have also gained some collectibility and higher price premiums amongst silver bullion bar aficionados. You can take discreet direct delivery or choose to store your 100 oz Silver Bars safely and securely with Kitco Allocated Storage. Kitco offers global options silver bullion storage that are fully segregated, insured and allocated. Kitco's network of top-tier silver vaults include some of the most secure silver storage facilities located in Canada, Hong Kong or the United States (COMEX approved). Cayman Islands silver storage is also available (certain conditions apply). Find out more about keeping silver bullion purchases secure, with our Global Precious Metals Storage Solutions. Why buy 100 oz Silver Bullion Bars from Kitco? Kitco is a trusted leader in the silver bullion and physical precious metals industry. 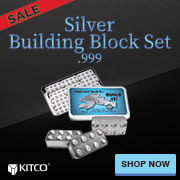 Silver bullion bars and other precious metals sold by Kitco are recognized in bullion markets around the world. With our focus on silver bullion, you can benefit from our low silver bar prices and premiums that are highly competitive in the industry. At Kitco, we make it easy for you to manage your wealth. You can sell or buy silver bars and other precious metals using our convenient online store, or by contacting our team of highly trained precious metals specialists. Backed by our global information network, Kitco has proudly served our customers since 1977. - The 100 oz Silver Bar(s) you receive will not be in mint condition as it is a secondary market product. Their value is highly correlated with their guaranteed 100 oz silver bullion content. - The 100 oz Silver Bullion Bar(s) you receive may be manufactured by a different refiner and may appear different from the 100 oz Silver Bar(s) illustrated here.